I can finally tell you (because I’ve stopped having dreams about it) about the huge 5-day-long party we threw at SXSW 2012. That’s right: not an evening or a day show at a random bar, but tons of excellent music spanning 5 full days, right in the center of Austin, at our own venue. 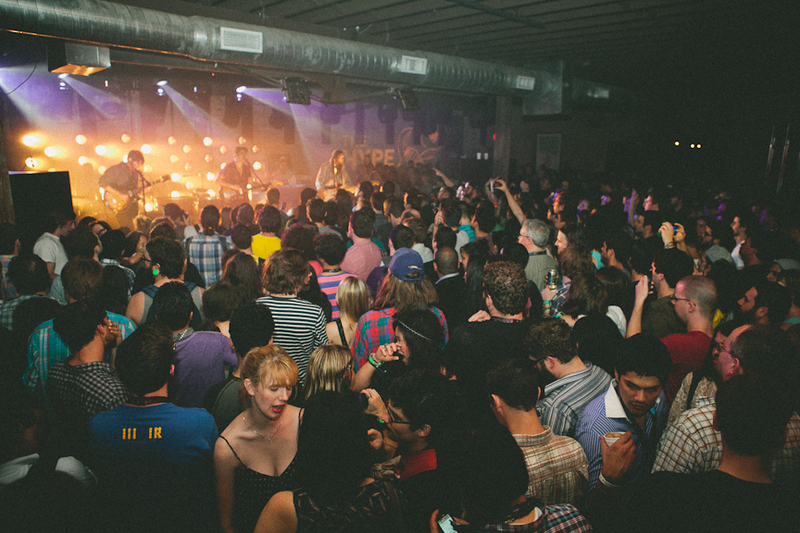 The Hype Hotel is the biggest thing we have ever done at SXSW. The idea was simple: transfer the online experience of the Hype Machine and music blogs to real life. So we teamed up with 9 of the internet’s finest: Aquarium Drunkard, My Old Kentucky Blog, Gorilla vs Bear, I Guess I’m Floating, Nialler9, No Modest Bear, Yours Truly, Song, by Toad and Cream Team. They curated day and night shows throughout the week, sharing their musical expertise with us. The bloggers, along with our team, booked 60 artists who played during the week the venue was open. There is no way to condense the long lines, the moshpits, the making out, the dancing, the sweat into one blog post—you just had to be there. But luckily, we have photos, Livestream recorded most of the performances, and you can still hear all the artists who played the Hotel on our schedule page. More videos from the shows will be appearing on the site and here over the next few weeks. We teamed up with Taco Bell’s Feed the Beat to make the whole event possible. They helped us foot the bill and provided thousands upon thousands of free Doritos Locos Tacos and bean burritos throughout the event, much to the delight of hungry SXSW attendees. At the end of the week, our guests had finished off 18,000 tacos. Can you imagine all those tacos in a room? Of course, we also kept everyone well-hydrated with Tito’s Handmade Vodka and Miller Lite. And if food and drinks weren’t your thing, you could’ve won the hundreds of SOL REPUBLIC headphones that were given away throughout the shows, snapped some shots in the free Hotel photobooth, or enjoyed a warm Texas breeze in the courtyard. I can’t thank everyone who worked, attended, played and contributed to this event enough. It was incredible to be able to translate something digital into a thrilling, tangible DYI experience that we could share with 25,000 of you. SXSW 2012, Part 1: Don’t Mess with the Internet! Now that we are a bit more rested after SXSW, I can tell you about what we’ve been up to there. We were involved in two big things: the Hype Hotel, presented by Feed the Beat during SXSW Music (more on this later), and the “Don’t Mess with the Internet” party during SXSW Interactive. We joined “Don’t Mess with the Internet” to celebrate the web’s victory over SOPA, the abusive legislation that was going through Congress earlier in the year. Over 15 million people got involved in the debate about control of the unternet, and our message was heard. Supporting the event along us were Mozilla, Conduit, Google, Reddit, Tumblr, Engine, Future of Music Coalition, Fight for the Future, Change the Ratio, GirlDevelopIt, the Cheezburger Network and New York Tech Meetup. The party was filled with people celebrating, speakers like danah boyd, Sara Chipps, Andrew McLaughlin of Tumblr, Holmes & Tiffiniy from Fight for the Future, Andrew Raseij from NYTM, and usual open bar SXSW antics—a must at any quality Interactive party. But the biggest thing was that with Alexis Ohanian’s help, a “Don’t Mess with the Internet” billboard will go up in the home district of Representative Lamar Smith, who authored the SOPA legislation. And what’s a party without music? We invited the excellent Remix Artists Collective (RAC) to perform at the event and make a special mix to celebrate our victory over SOPA. RAC was a natural choice—they are a great example of what is possible with open internet where anyone can share their work online. The mix they created is a thank you to all the 15 million people who stopped SOPA and a strong reminder of why this stuff matters. With SOPA thrown out, party complete and billboard on the way, we are far from done. It is likely that revised legislation will reappear in Congress, so we must be ready to continue the fight for freedom on the internet. There are a number of organizations where the discussion is continuing: Engine Advocacy, Demand Progress, Fight for the Future, and The Future of Music Coalition, as a place for musicians to be involved. Join us!